Just to let you know we are doing the Davis method twice a week and it’s working well most of the time. Finn is really responsive to it and he gets great results , it’s also a real pleasure for me to hear his examples and discover how Finn ticks ,his sentences are really creative and his plasticine models are priceless and if I dare say it I am getting the hang of it too; it’s trial and error in the beginning but as I become more comfortable with the method so does he. Another thing we tried is a weekly chart , ever since Finn went to school homework has been a real stress for him and myself , lots of arguing about when , how , what , how long , unfair etc etc . And then when I mention reading , well that usually sends him over the edge: Lots of tears of frustration ( on both sides) and as he enters into his third year of school as a second year (having completed preschool and first year) I knew as the discussions of the dreaded homework /reading started to escalate , I , for my own sanity and for Finn ,had to nip it in the bud ASAP. At first I tried passing the responsibility onto him telling him he could do it whenever he chose , but it had to be done before bed , I tried this for a week but as Finn has no concept of time this was impossible for him and he ended up getting up in the morning and rushing through it, which he seemed to manage ( just) but I found it a lot harder as it interfered with my morning routine ( I am not a morning person) and as he only had a certain amount of time to do it instead of a longer time period. When he got home from school he often left with incomplete work which put him under more stress at school and he began the day as a failure . I had tried to put the responsibility on him but it really backfired. He just wasn’t ready and if I’ve tried something and it doesn’t work and I can see even with time this isn’t going to work ,I just move on to something else … But what ?? Until a friend of mine suggested a chart of his daily activities which is what I did. 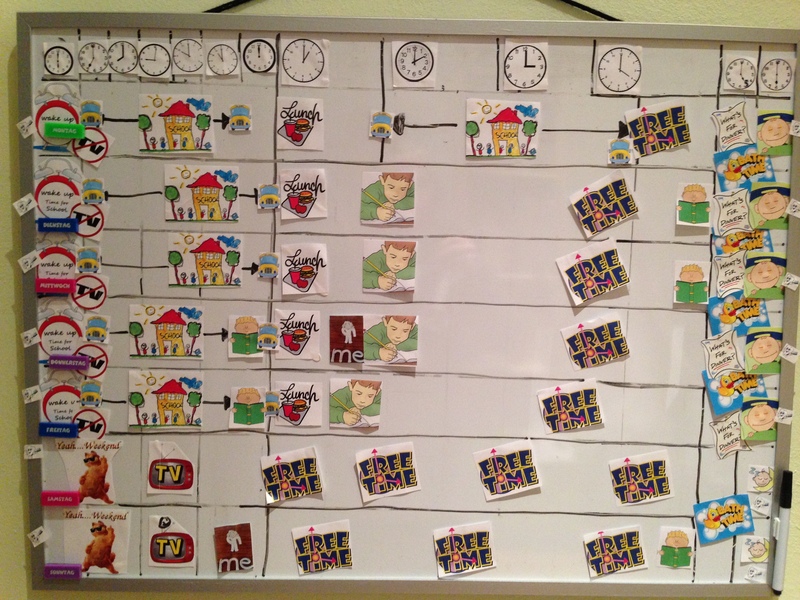 Finn is a visual learner and from the minute the chart /schedule was finished, he could tell me what it all meant. On day 2 a friend came to play , I told them that they should get their homework done and then they could play. Usually this would be Finn’s cue to fall apart; instead, Finn then turned to his friend and said ” Nina, let’s do it straight away, cause if you compare it to our free time , homework is nothing and if you don’t believe me check the chart!” I couldn’t believe my ears. One of our biggest discussions is how unfair it is because all we do is homework and he has no time to play ( not true but that’s how he saw it ). Now If he asks to watch TV, I just say “Oh, I don’t know. Today is Wednesday ( tues, thurs) what does the chart say?” He comes back and says, “No mum, it’s a school day, but I can watch it in 3 sleeps” etc. ( TV /IPad was always a big issue, I try not to let him watch during the week , not because I don’t like TV, but because it’s always a discussion how long, etc and turning it off well ,don’t get me started on that …but not anymore) In fact on a school day he’s stopped asking. He tells me when we do the David method. I used to choose a day when we weren’t too busy, but we live on a farm and we are always busy so now we have two fixed days, he knows it, it works! I just wanted to write and tell you, because maybe you have other parents who it might help. I know that the Davis method works for Finn , and now I know that letting him see his week in a way that he gets it, has reduced our stress immensely . I still think you were heaven scent. Categories: Uncategorized | Tags: #charts for timing, #dyslexics and timing, #struggling reader, #sydneydyslexia | Permalink. More love and logic – well, it may be almost an hour of listening, but if you need it, it’s not long enough, otherwise you won’t listen anyway. Many parents find it hard to set boundaries, especially if they have children with special needs, children who may already struggle at school and feel frustrated. It may feel that all they need at home is a loving environment that makes allowances for them. Unfortunately the loving parent also needs to add the ‘logic’ part, in order to raise a child that will be able to fully participate in life and contribute, instead of sabotaging their life with a sense of entitlement. As Jim in the interview says, boundaries and limits are basic human needs. Categories: Uncategorized | Tags: #kids and boundaries, #sydneydyslexia, kids and a sense of entitlement, kids&boundaries | Permalink. Pearls of Wisdom that I think any parent can benefit from. I have had the pleasure to learn to use the Love and Logic method this week with a lovely mum and her 10-year old son – and it made our week most memorable and inspiring. If her son hadn’t been able to challenge us to a point where we felt that we had to abandon our dyslexia correction program on Day 2, I might not have learnt about this wonderful process. To cut a long story short: Day 2 was a write-off and half of Day 3 as well, very challenging (especially for mum to react differently and firmly, despite the tantrums), but have paid off like magic! The remainder of the program has been very fruitful. Ewen (I changed his name) has written his first book and started the reading and spelling journey, where he previously couldn’t read more than Year 1 books. He loves making clay models, learns words that go with the story, comes up with great imaginary tales and is generally enthusiastic and gained more confidence every day. Thank you to the mum for persevering! I shall never forget this experience. Categories: Uncategorized | Tags: #changing behaviour, #getting kids to do their chores, #loveandlogic, #no more tantrums, #sydneydyslexia | Permalink.